The outer layers of the star will get much, much bigger. The star will get brighter, sometimes as much as ten thousand times as bright as when it was on the main sequence. Since the outside of the star will get bigger, the energy will be spread over a much larger area. Because of this, the temperature of the surface will go down and the color will change to red or orange. The red giant phase is temporary. It's shorter than the billions of years a star spends on the main sequence. Soon (in only hundreds of millions of years) red giants will start to fuse helium to make other elements like carbon, nitrogen and oxygen. Some of their outer layers will blow away, leaving interstellar gas and dust circling the star. In time, most red giants will become white dwarfs. 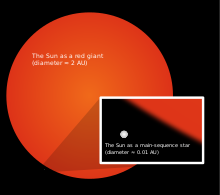 Very large red giants become neutron stars or black holes.